A great way to practice knitting in the round is to make a pair of fingerless mitts. Knit in a comfortable gauge of 4 stitches per inch, these will work up in no time at all. Make a pair to match the simple ear warmer, and you’re fashionably set for cool-weather outings. If you would like to make both projects in the same yarn, you will need about 125 yards of worsted-weight yarn. A worsted-weight yarn that is both warm and soft would be a good choice for this project. Choose a fiber that has good elasticity because you want your mitts to stay on your hands comfortably and not stretch out and sag. Cast on 28 stitches and arrange your work on the needles according to the directions for your chosen knitting method. Join your work to knit in the round, being careful not to twist your cast on around the needles. Place a stitch marker to indicate the end of the round. Repeat Step 2 until your work measures about 5 inches from the cast-on edge. At the beginning of the next round, create a hole for your thumb by binding off the next 4 stitches. Then work in knit 3, purl 1 rib to the end of the round. 5Using the backward-loop cast-on, create 4 new stitches at the beginning of the round. Then work in knit 3, purl 1 rib to the end of the round. On the next round, work all stitches in the knit 3, purl 1 rib pattern. Work the first 4 stitches fairly tightly to prevent a gap from forming on either side of the new thumb hole. 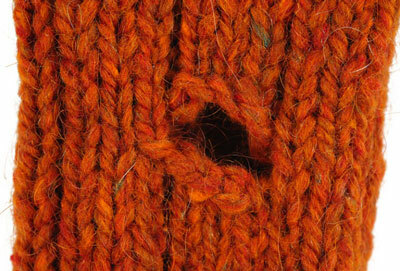 Continue working in pattern as established until your work measures 2-1⁄4 inches from the edge of the thumb hole. Repeat steps 1–8 to make a second mitt to match. Wash and block the mitts, if desired.